I've been slacking on the #52weeksofhome. Life got busy after our awesome trip to Franklin and everyday I'm reminded that I'd much rather be around old houses and old house people than, well... pretty much anything. Anyway, here is to #52weeksofhomeweek15: tile. I love love old tile. These are the tiles for 4 of our 5 fireplaces. You can totally see the wear and tear from 120+ years of use. I actually like that they are less than perfect. To me, they have moxie! Fun fact: snow is made of water. Snow melts and turns into water. Water will follow the path of least resistance and end up in the basement. Given its liquid slinky-ness, water flows a lot faster than you’d expect. Last night, as I was feeling pretty accomplished for asking the Hubs to check on the wonky dehumidifier in the basement. I thought “way to go! We’ll get ahead of all this humidity and make sure the basement is not damp. Yey me, the responsible homeowner.” Without a care in the world, I amused myself by taking the stupid Buzzfeed quiz on what profession should I have, or what Muppet character I should be (CEO, Animal). Hubs is in the basement a looooong time, and eventually resurfaces in a huff. Water is pouring in through the hatch. A lot of water, he says. Our basement is notoriously damp (hence the dehumidifier), but the look on his face makes it clear that this is worse. Much worse. I immediately think it’s my pseudo snow moat in the front yard. 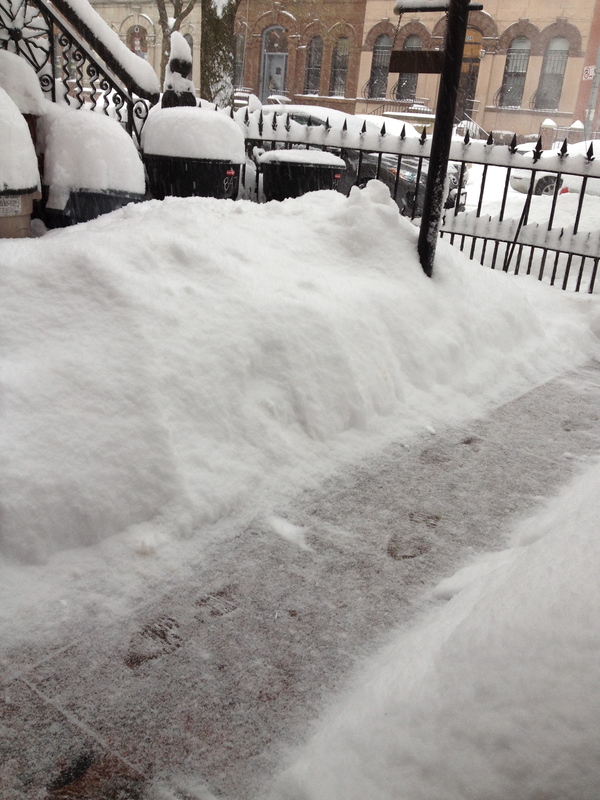 I piled the snow pretty high on top of the coal chute. I thought it was fun. Stupid me, the silly and immature homeowner. Turns out the problem was with the rear hatch instead. A lot of water was coming through and it was hard to tell exactly where, because (of course) this happened around 10 pm. Down the fire escape we go with flashlights and shovels. Did I mention it was raining? 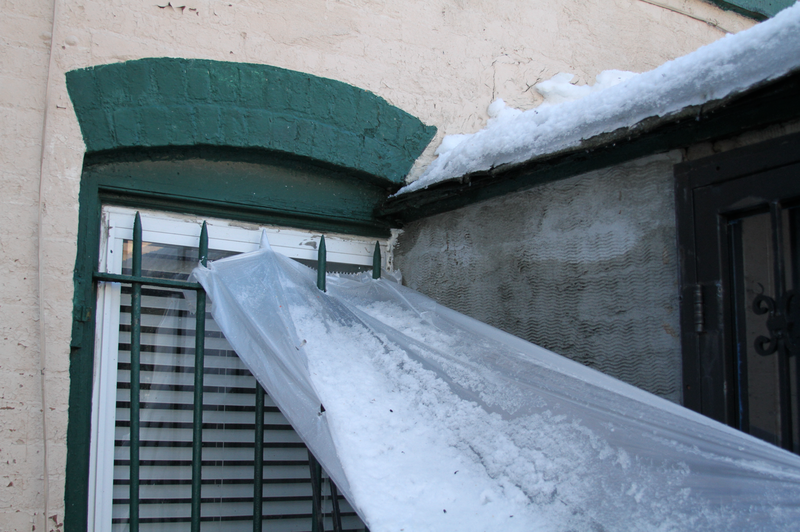 The culprit was a frozen downspout, actually THE frozen downspout since there is only one for the whole roof. Why? Because in spite of its beauty, Victorian architecture doesn’t always make sense. Anyway, the rain was melting the snow and the water was finding alternate routes to the ground. It just so happens that the best path was into a puddle at the base of the hatch. 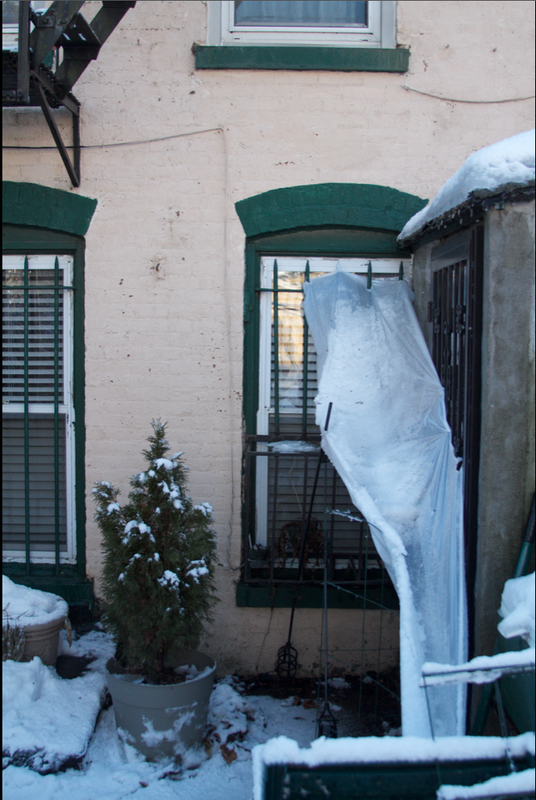 After a lot of shoveling and moving stuff out of the way, we concocted this makeshift gutter to channel the water away from the house. Last night’s McGyver gutter as seen this morning. It actually worked. The problem was this spot, where water was coming down super close to the foundation and just making an enormous puddle. Shockingly, this held up with the wind and all the rain. Yey 0.7 mil plastic drop cloth. I don’t have any photos of the water in the basement, as we were in full crisis mode to make it go away. I think we probably vacuumed up about 1oo gallons or so, maybe more. Of course, the wonky dehumidifier that got us started on this is broken. So happy Valentine’s Day Hubs. Haven’t you always wanted a shiny new dehumidifier? NextThe Cockloft – it’s a thing, apparently. This was awesome! Thank you @madisonstreetsalvage.